Philadelphia Flyers head coach Dave Hakstol looks on during the second period against the Arizona Coyotes at Gila River Arena. 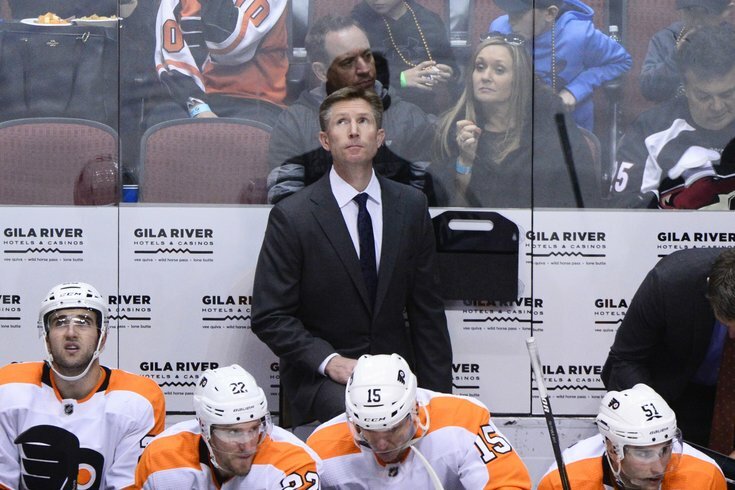 Back in December, Dave Hakstol was the easy target for Flyer fans' venom. The demeanor of the coach doesn't help. Publicly, he’s a little on the wooden side, wearing a blank façade — the Mr. Spock of NHL coaches, minus the pointed ears. Adding to that was the fact that the Flyers were flailing. They were going through an 0-5-5 patch, sitting in last place in the NHL’s Metropolitan Division and seemingly light years from the playoffs. Nothing was working, especially the offense, which was shutout three times during that span. So, who do you blame? Naturally, the coach, Hakstol, right? There were even rumors that Hakstol’s demise was imminent the first week of December. Since then, the Flyers have gone 22-8-3 (47 points). Since then, the Flyers have had the third-best record in the NHL, behind only Boston (23-5-4, 50 points) and Las Vegas (23-6-3, 49 Points). The Flyers just completed a memorable weekend, beating the Columbus Blue Jackets for the first time in Columbus since Dec. 13, 2005, on Friday. Then they came back to beat the New York Rangers, 7-4, in an old-school style game, winning in Madison Square Garden. Since then, the Flyers have beaten the NHL’s two top teams, Tampa Bay and Vegas, both away. Since then, they’ve climbed from last in the Metropolitan to a playoff spot, just four points behind the two-time defending Stanley Cup champion Pittsburgh Penguins in the division, with two games at hand. Over their last eight games, the Flyers are on a 6-0-2-point streak. So, who’s the cause for this success? The coach, Hakstol, right? Hakstol’s fan base may be increasing at a glacial pace, but his move to make Sean Couturier the Flyers’ first line center has been brilliant. All Couturier has done is blossom into one of the best two-way centers in the NHL, smashing previous personal bests with 29 goals and 30 assists. His 29 goals put place tied for sixth with Dallas’ Tyler Seguin and the New York Islanders’ Anders Lee. When the Flyers beat Vegas, 4-1, the line of Couturier, Claude Giroux and Travis Konecny combined for seven points (2G, 5A), in comparison to Vegas’ top line of Reilly Smith, William Karlsson and Jonathan Marchessault, which produced one. Against the Rangers, it was more of the same. Five different Flyers recorded multiple points, though the line of Giroux (1-2-3), Konecny (1-2-3) and Couturier (0-1-1) combined for seven points. In his last five games, Konecny has produced seven points (2G, 5A) and in the month of February, he’s had 11 points in nine games (4G, 7A) for a plus-7—and had first career three-point game against the Rangers. Hakstol’s patience with Nolan Patrick, who was 12-for-16 (75%) on faceoffs on Sunday, and young defensemen Ivan Provorov, Shayne Gostisbehere and Robert Hagg continue to spur dividends. Moving Giroux to left wing has rejuvenated “the captain,” who’s healthy and having one of his finest seasons as a Flyer, leading the team with 69 points (20G, 49A), the most since the 2014-15 season. “I just think if you look back at that stretch of 10 games, no one quit on each other, we were there for each other every single game,” Konecny told NBC’s Joe Micheletti after beating the Rangers. “We knew were deserved better. A lot of the times the bounces weren’t going out way and it’s part of hockey. When you go through some adversity like that, it builds a lot of character and a lot of relationships on the team. Now, Hakstol and Flyers’ general manager Ron Hextall are faced with another challenge. With both goaltenders, Brian Elliott and Michal Neuvirth, who left Sunday’s game against the Rangers after the first period with a lower-body injury, out with injuries, do they mortgage a piece of the future in going after Buffalo’s Robin Lehner (12-22-8, 2.95 GAA) or Arizona’s Antti Raanta (12-14-6, 2.45 GAA) for possibly a second-round draft pick? Alex Lyon picked up his first NHL win in relief of Neuvirth, making 25 saves on 26 shots. But he doesn’t appear to be a solvent answer if the Flyers plan on making a playoff run. The Flyers need help and the future, Carter Hart, won’t be able to answer anything until at least next year. This is a team that appears playoff bound, and with all of the pieces coming together, thanks to Hakstol’s patience and belief in this team, it may be the right time to push in and see what happens. The Flyers were last in the playoffs in 2015-16, and have been to the playoffs in only two of the last five years. They haven’t won a playoff series since April 22, 2012, when they beat Pittsburgh in six games.